Pasta & Couscous Market: Global Industry Analysis and Forecast, 2016–2026,” – a new publication by Persistence Market Research offers a 10-year forecast for the global pasta and couscous market. Financial performance of top companies, global growth rate of pasta and couscous, and macroeconomic indicators such as food industry outlook and health supplement spending are some of the forecast factors that have been included in this report. The primary objective of the report is to offer insights on advancements in the global pasta and couscous market. The study demonstrates market dynamics that are expected to influence the current environment and future status of the global pasta and couscous market over the forecast period. The report also offers updates on trends, drivers, restraints, value forecasts, and opportunities for manufacturers operating in the global pasta and couscous market. A section of the report discusses the overall competitive landscape of the global pasta and couscous market. Currently, the industry is highly fragmented due to its heavily localized nature and lack of major global-level firms. This scenario is expected to change owing to increasing consolidation across the supply chain and emergence of several new manufacturing techniques. The report also discusses the various factors that are shaping internal as well as external competition in the market. It analyzes the market share of the global pasta and couscous market on the basis of product form, product type, raw material, distribution channel and region. A section of the report highlights region-wise pasta and couscous demand. It provides a market outlook for 2016–2026 and sets the forecast within the context of the pasta and couscous ecosystem, including new technological developments as well as product offerings in the global pasta and couscous market. 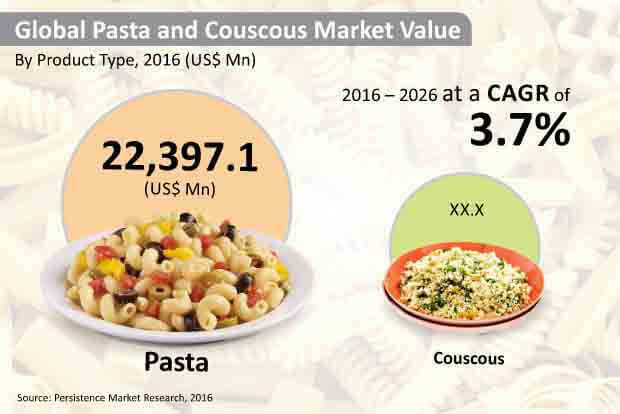 This study discusses key regional trends contributing to the growth of the pasta and couscous market globally, as well as analyses the degree to which drivers are influencing the market in each region. Various barriers to entry in the industry are analyzed and rated on the basis of their impact on the competition level in the market. The report on the performance of the global pasta and couscous market begins with an overview of the market followed by key definitions and an executive summary that gives a 360o view of the revenue forecast of the global pasta and couscous market. We also present the market taxonomy in this section where we segment the global pasta and couscous market on the basis of product, raw material, form, distribution channel type and region. In the next section, we do a deep dive into the key market dynamics and present our independent analysis of the various factors, challenges, and market trends that we feel will define the market in the next few years. The following sections quantify our analysis of the global pasta and couscous market by presenting data on the market size along with key performance metrics. In the final section of the report, a competitive landscape has been included to provide report audiences with a dashboard view. Key categories of providers covered in the report are pasta and couscous suppliers and customers. Detailed profiles of the providers are also included in the scope of the report to evaluate their long-term and short-term strategies, key offerings and recent developments in the global pasta and couscous market. Yearly change in inflation rate has not been considered while forecasting market numbers. Top-down approach has been used to assess market numbers for each segment, while bottom-up approach has been used to counter-validate the reached numbers for segment type market numbers. Macroeconomic indicators such as food industry outlook, food and health supplement spending, and others have been considered to arrive at the indicated market numbers. The report not only conducts forecasts in terms of CAGR but also analyzes the global pasta and couscous market on the basis of key parameters such as year-on-year (Y-o-Y) growth to understand the predictability of the market and to identify the right opportunities across the market. All values for market size are in US$ (US Dollar). Also, another key feature of this report is the analysis of all key segments in terms of absolute dollar. This is traditionally overlooked while forecasting the market. However, absolute dollar opportunity analysis is critical in assessing the level of opportunity that a provider can look to achieve, as well as to identify potential resources from a sales and delivery perspective in the global pasta and couscous market. Pasta segment is anticipated to account for a relatively high revenue share in the global pasta and couscous market over the forecast period. The segment is projected to be valued at more than US$ 20 Bn by 2017 end and is estimated to increase at a CAGR of 3.6% over the forecast period, to be valued at a little more than US$ 30 Bn by the end of 2026. The segment is projected to create absolute $ opportunity of more than US$ 600 Mn in 2017 over 2016 and incremental $ opportunity of a little more than US$ 10 Bn between 2016 and 2026. Pasta segment is anticipated to remain dominant in the global pasta and couscous market throughout the forecast period with a revenue share of more than 70% by 2026. An increasing number of young consumers with a hectic and fast-paced lifestyle prefer convenient, easy to cook, and affordable food options. Pasta and couscous are products that are convenient, ready-to-cook, affordable, offer versatility, and come with health claims such as gluten-free and whole grain food. Apart from it pasta is a healthy and convenient food option among families especially with children. Growing number of working women and younger population with busy lifestyles in countries of the Asia Pacific and Middle East preferring convenience and healthy food options is another major factor expected to drive the growth of the pasta segment over the forecast period. Owing to rapid development in various economies, lifestyle of the middle-class section has improved significantly in the recent past. Also, growing number of working members in a family and increasing disposable income has resulted in changing food consumption patterns. Convenience food consumption is on the rise and this change is likely to significantly fuel the growth of the pasta segment in the years to come. The raw material needed for the production of pasta such as wheat, barley, rice, maize etc. is widely grown in almost all parts of the world and is therefore easily available. This factor is creating a positive impact on the pasta segment. Increasing obesity with changing lifestyle and eating habits is resulting in a rapid consumer shift towards high protein content and gluten-free and low-calorie food products. Consumer demand for such healthy food options is increasing significantly in countries such as the U.S., U.K., and Japan. Increasing demand for value-added products in various countries is prompting manufacturers to offer healthy pasta and other convenience food products with additional nutritional benefits. This increasing demand for pasta is creating robust development in the pasta segment. A substantial percentage of total revenue from pasta and couscous food products comes from the organized retail format. With economies growing, the retail chain is growing rapidly, which is predicted to drive demand for pasta in developing economies. The pasta segment is estimated to be valued at more than US$ 5,000 Mn by 2017 end and is anticipated to increase at a CAGR of 3.4% over the forecast period, to be valued at more than US$ 7,000 Mn by the end of 2026. In Latin America, the segment is projected to create absolute $ opportunity of more than US$ 150 Mn in 2017 over 2016 and incremental $ opportunity of little more than US$ 2,500 Mn between 2016 and 2026. In Europe the segment is likely to increase at a CAGR of 3.5% over the forecast period. In APAC, the pasta segment is projected to be valued at a little more than US$ 1,000 Mn by the end of 2026.